I am really excited to have my work Reference Point selected as one of the 42 international artworks for Emerge 2014. This will be my first international exhibition! 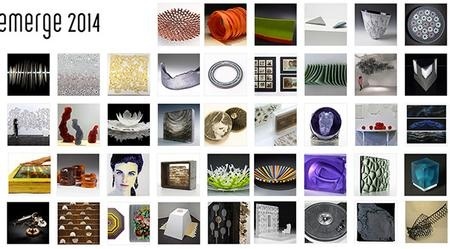 Emerge 2014 is Bullseye's eighth biennial kiln-glass exhibition for emerging artists, running from April 8 - June 28, 2014. The Emerge 2014 awards ceremony will be held on April 12, 5:30-7:30pm at Bullseye Gallery (Portland, USA). Emerge recognizes the efforts of students, early-career artists, and artists from other media who are rising through the ranks of kiln-formed studio glass and design, but have not been represented by a major gallery at an art fair. Selected from 326 entries, the 42 finalists for 2014 were evaluated on the excellence of their concept, craftsmanship, and design by a panel of three jurors. The finalists hail from 32 countries and represent 35 schools, including graduate and undergraduate programs from Canberra, Australia, Rochester, New York, and Edinburgh, Scotland, among others. The 2014 jurors are independent curator Kathleen Moles, artist Emily Nachison, and James Yood, critic and Associate Professor of Art History at the School of the Art Institute of Chicago.